It appeared, momentarily, like a 50-km tall banded flag. In mid-March, an energetic Coronal Mass Ejection directed toward a clear magnetic channel to Earth led to one of the more intense geomagnetic storms of recent years. 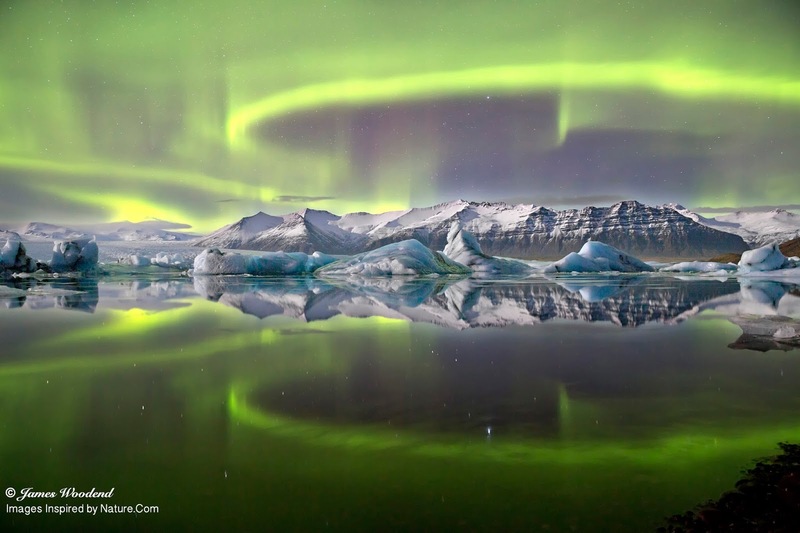 A visual result was wide spread auroras being seen over many countries near Earth's magnetic poles. Captured over Kiruna, Sweden, the image features an unusually straight auroral curtain with the green color emitted low in the Earth's atmosphere, and red many kilometers higher up. 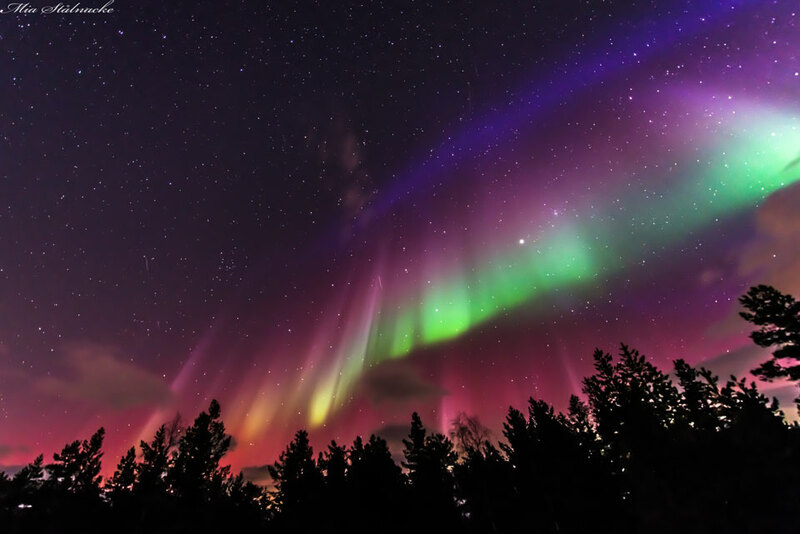 It is unclear where the rare purple aurora originates, but it might involve an unusual blue aurora at an even lower altitude than the green, seen superposed with a much higher red. As the Sun continues near its top level of surface activity, colorful nights of auroras over Earth are likely to continue. 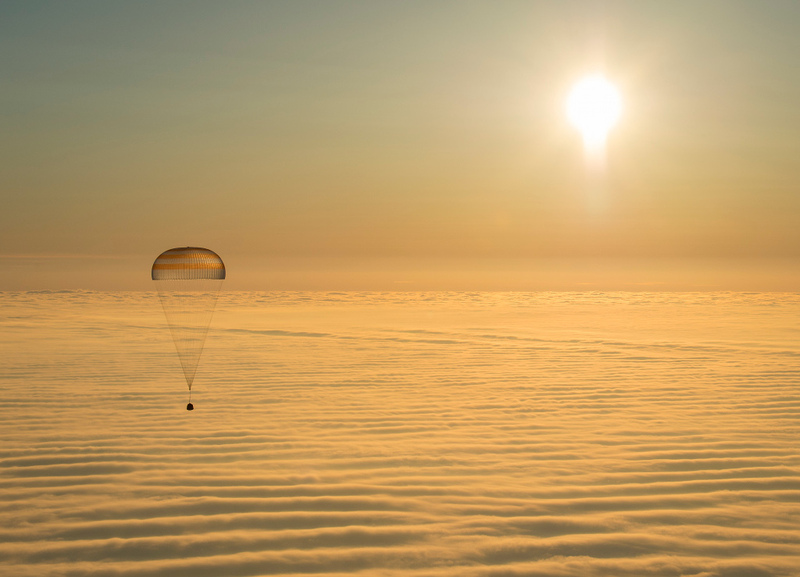 Thursday, shortly after local sunrise over central Asia, this Soyuz spacecraft floated over a sea of golden clouds during its descent by parachute through planet Earth's dense atmosphere. On board were Expedition 42 commander Barry Wilmore of NASA and Alexander Samokutyaev and Elena Serova of the Russian Federal Space Agency (Roscosmos). Touch down was at approximately 10:07 p.m. EDT (8:07 a.m. March 12, Kazakh time) southeast of Zhezkazgan, Kazakhstan. The three were returning from low Earth orbit, after almost six months on the International Space Station as members of the Expedition 41 and Expedition 42 crews. Snowy and cold is weather you might expect at the start of spring for Longyearbyen on the Arctic archipelago of Svalbard, Norway. But that turned out to be good weather for watching the Moon's umbral shadow race across northern planet Earth. 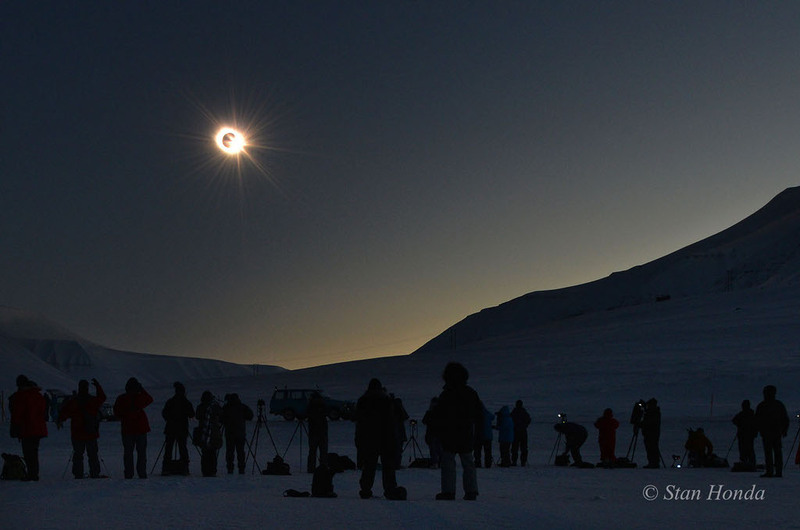 The region was plunged into darkness for 3 minutes during the March 20 total solar eclipse while insulated eclipse chasers witnessed the dark Sun in the cold clear sky. In this well-timed snapshot captured near the end of totality, the Moon's shadow sweeps away from the horizon and the solar corona fades as the lunar disk just begins to uncover the Sun. Streaming past the Moon's edge, direct rays of sunlight create the fleeting appearance of a glistening diamond ring. 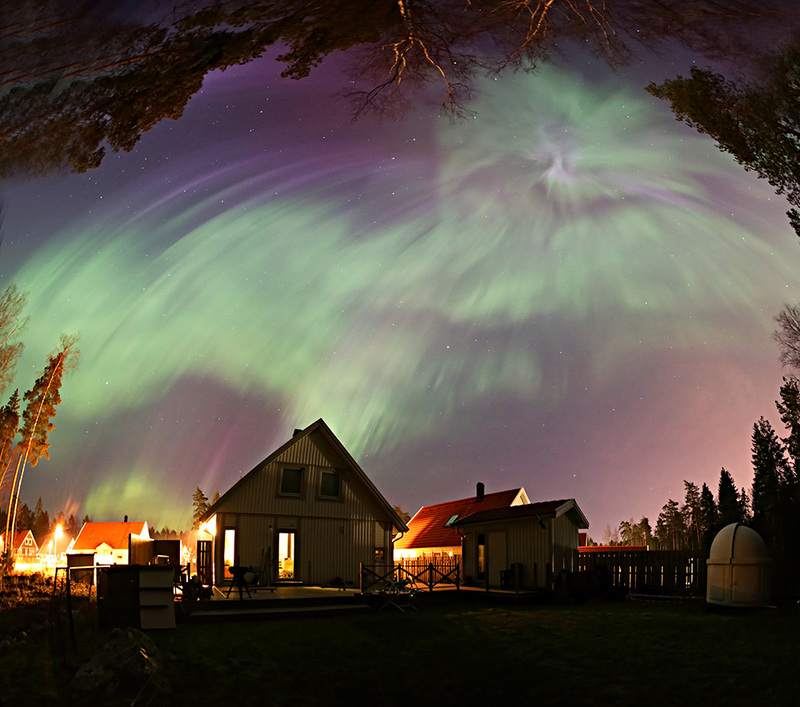 On the night of March 17/18 this umbrella of northern lights unfolded over backyards in Vallentuna, Sweden about 30 kilometers north of Stockholm. 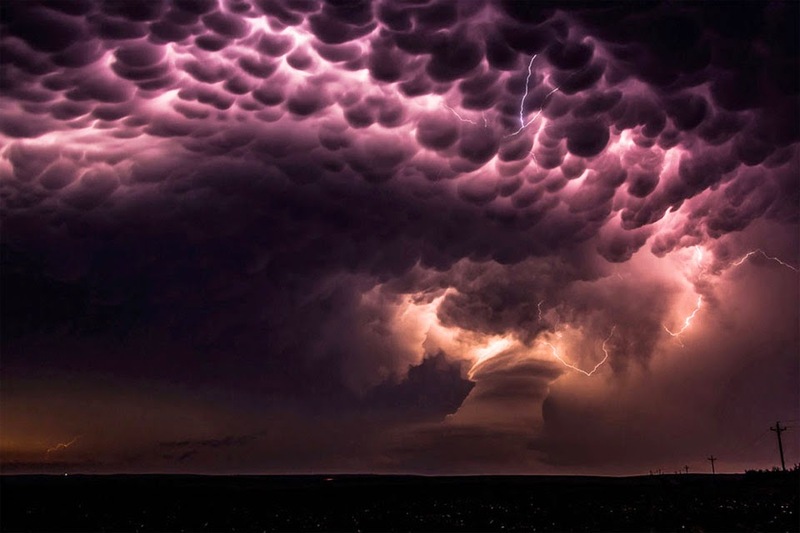 A result of the strongest geomagnetic storm of this solar cycle, auroral displays were captured on that night from back and front yards at even lower latitudes, including sightings in the midwestern United States. A boon for aurora hunting skywatchers, the space storm began building when a coronal mass ejection, launched by solar activity some two days earlier, struck planet Earth's magnetosphere. So what's the name of the backyard observatory on the right of the wide field view? That's Carpe Noctem Observatory, of course. 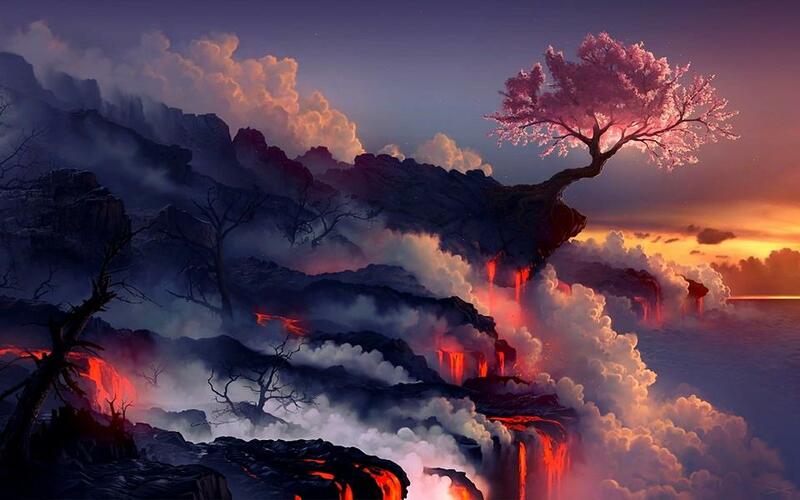 Would you go to the end of the world to see a total eclipse of the Sun? If you did, would you be surprised to find someone else there already? 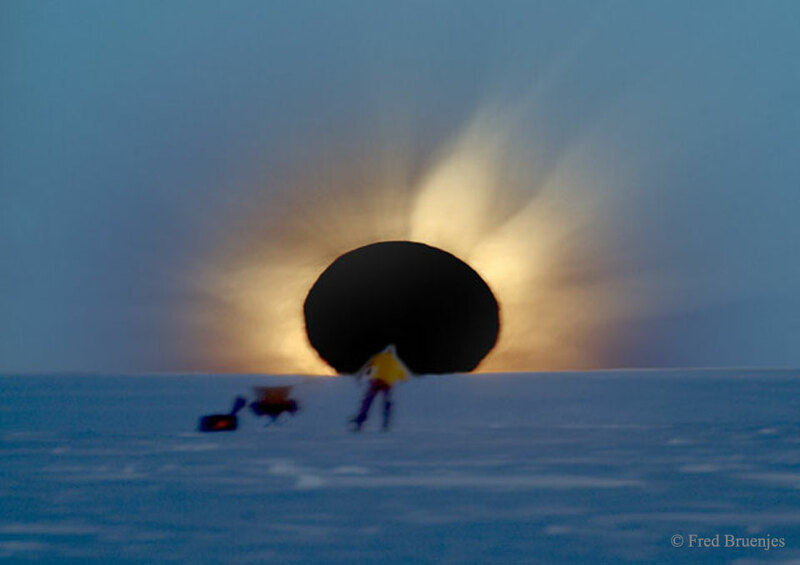 In 2003, the Sun, the Moon, Antarctica, and two photographers all lined up in Antarctica during an unusual total solar eclipse. Even given the extreme location, a group of enthusiastic eclipse chasers ventured near the bottom of the world to experience the surreal momentary disappearance of the Sun behind the Moon. One of the treasures collected was the above picture -- a composite of four separate images digitally combined to realistically simulate how the adaptive human eye saw the eclipse. As the image was taken, both the Moon and the Sun peeked together over an Antarctic ridge. In the sudden darkness, the magnificent corona of the Sun became visible around the Moon. Quite by accident, another photographer was caught in one of the images checking his video camera. Visible to his left are an equipment bag and a collapsible chair. A total solar eclipse will occur on Friday and be visible from the north Atlantic Ocean. 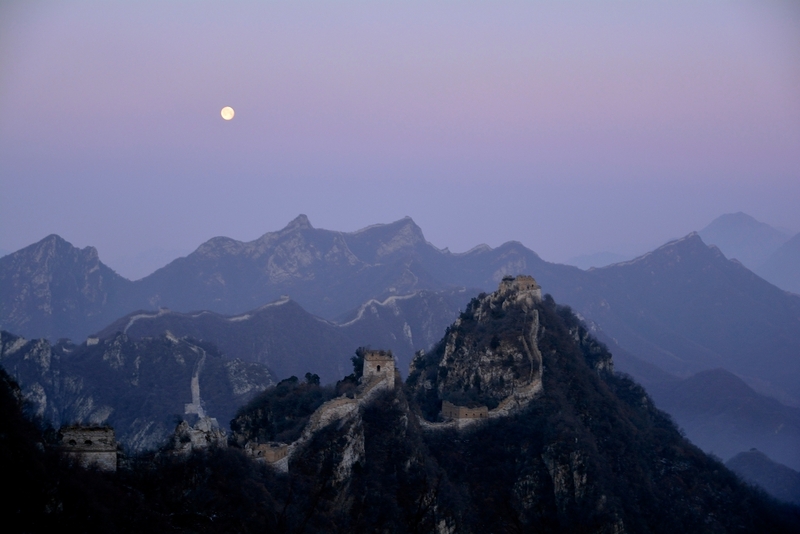 Last Friday, an almost Full Moon rose as the Sun set, over this mountainous landscape north of Beijing, China. Also near apogee, the farthest point in its elliptical orbit around planet Earth, it was this year's smallest and faintest Full Moon. The Jiankou section of the Great Wall of China meanders through the scene, the ancient Great Wall itself the subject of an older-than-the-space-age myth that it would be visible to the eye when standing on the lunar surface. But even from low Earth orbit, the large scale artifact of human civilization is very difficult to identify. At its farthest from our fair planet, the Moon shines brightly in the twilight sky though, posing in the faint, pinkish band known as the antitwilight arch or the belt of Venus. What does the Earth look like during a total solar eclipse? It appears dark in the region where people see the eclipse, because that's where the shadow of the Moon falls. The shadow spot actually shoots across the Earth at nearly 2,000 kilometers per hour, darkening locations in its path for only a few minutes before moving on. 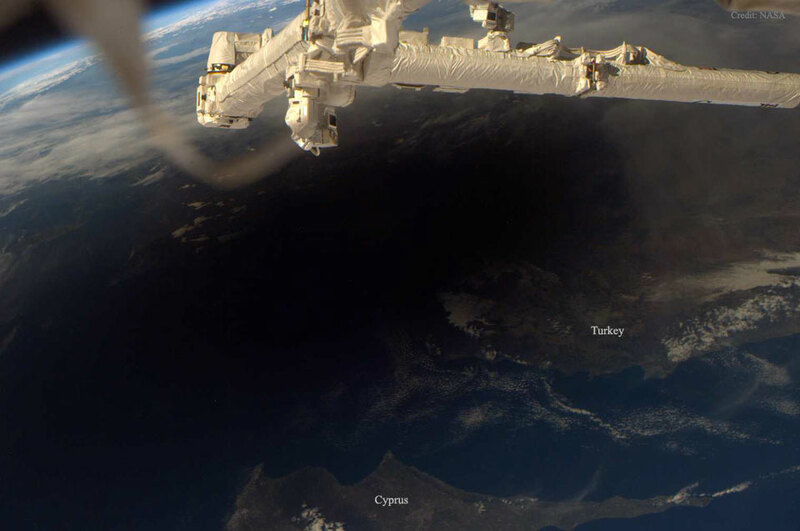 The featured image shows the Earth during the total solar eclipse of 2006 March, as seen from the International Space Station. On Friday the Moon will move in front of the Sun once again, casting another distorted circular shadow that, this time, will zip over part of the north Atlantic Ocean. 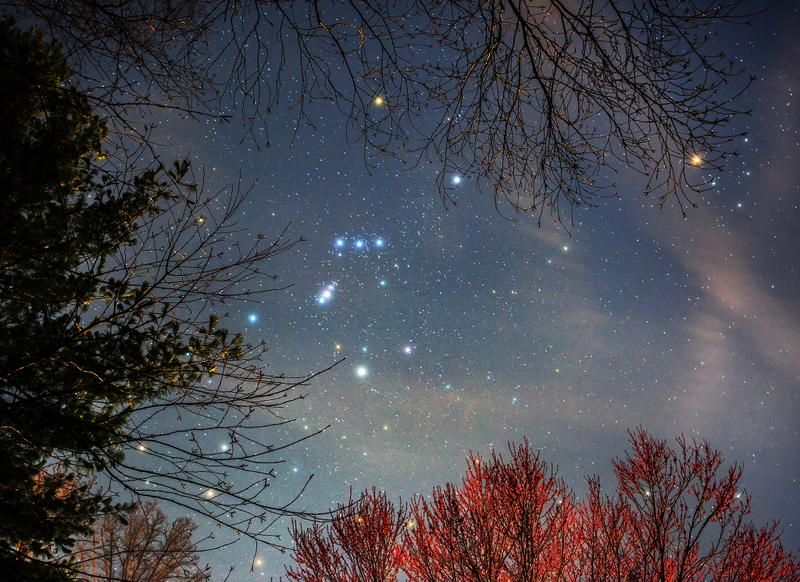 As spring comes to planet Earth's northern hemisphere, familiar winter constellation Orion sets in early evening skies and budding trees frame the Hunter's stars. The yellowish hue of cool red supergiant Alpha Orionis, the great star Betelgeuse, mingles with the branches at the top of this colorful skyscape. Orion's alpha star is joined on the far right by Alpha Tauri. Also known as Aldebaran and also a giant star cooler than the Sun, it shines with a yellow light at the head of Taurus, the Bull. Contrasting blue supergiant Rigel, Beta Orionis, is Orion's other dominant star though, and marks the Hunter's foot below center. Of course, the sword of Orion hangs from the Hunter's three blue belt stars near picture center, but the middle star in the sword is not a star at all. A slightly fuzzy pinkish glow hints at its true nature, a nearby stellar nursery visible to the unaided eye known as the Orion Nebula. 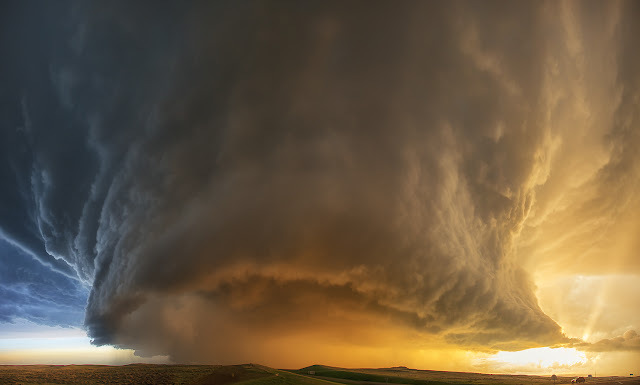 Several key conditions came together to create this award-winning shot. These included a dark night, few clouds, an epic auroral display, and a body of water that was both calm enough and unfrozen enough to show reflected stars. The featured skyscape of activity and serenity appeared over Iceland's Vatnajökull Glacier a year ago January, with the Jökulsárlón Iceberg Lagoon captured in the foreground. Aurora filled skies continue to be common near Earth's poles as our Sun, near Solar Maximum, continues to expel energetic clouds of plasma into the Solar System. It is not every day that such an interesting cloud photobombs your image. The original plan was to photograph a rare angular conjunction of Mars and Venus that occurred a week and a half ago, with the added bonus of a crescent Moon and the International Space Station (ISS) both passing nearby. Unfortunately, on Madeira Island, Portugal, this event was clouded out. 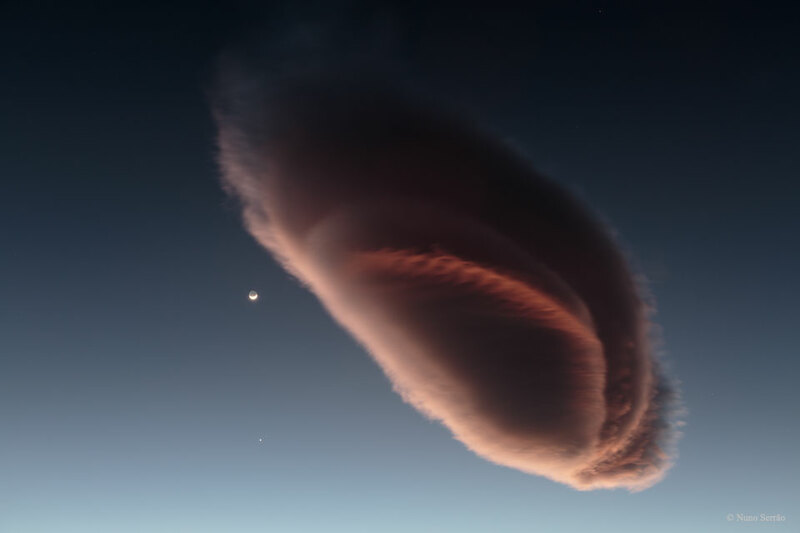 During the next day, however, a spectacular lenticular cloud appeared before sunset, so the industrious astrophotographer quickly formulated a new plan. A close look at the resulting image reveals the Moon visible toward the left of the frame, while underneath, near the bottom, are the famous planets with Venus being the brighter. It was the unexpected lenticular cloud, though, perhaps looking like some sort of futuristic spaceship, that stole the show. 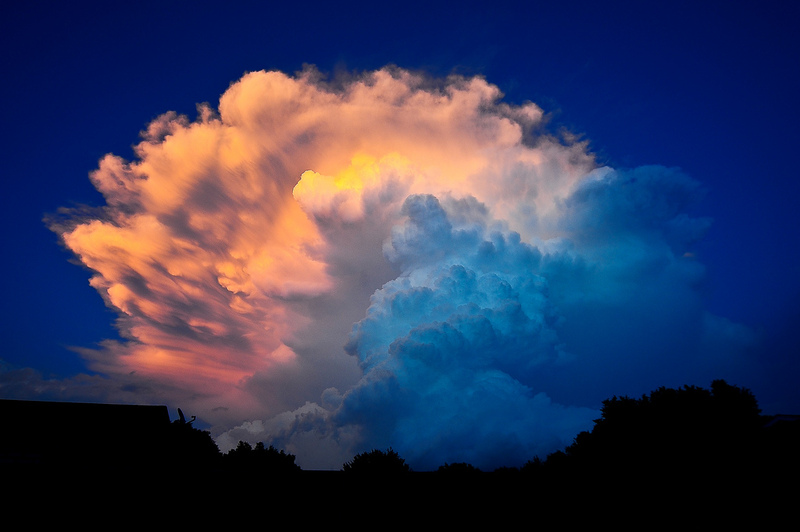 The setting Sun illuminated the stationary cloud (and everything else) from the bottom, setting up an intricate pattern of shadows, layers, and brightly illuminated regions, all seen evolving in a corresponding video. Mars and Venus will next appear this close on the sky in late August, but whether any place on Earth will catch them behind such a photogenic cloud is unknown.